NIMD > News > Politics In Colombia: A Risky Business? Politics In Colombia: A Risky Business? Political change is seldom a risk-free affair, especially when it comes to transitioning to democracy. Even a cursory glance at the history books shows the ferocious uphill struggle that has to be fought in such circumstances, from Britain to Benin and beyond. Since the signing of the landmark Peace Agreement in 2016, the context of Colombia’s democratic transition has had its own particular challenges. The most pressing of which has been ongoing political violence. Between January and October 2018, 289 Colombian social, political, and communal leaders were victims of violence. Of these, 130 were killed. Such dramatic figures show that parties and leaders must collectively reflect on how they can address the issue. Andrés Saenz, manager of NIMD’s Democratic Action for Peace Project, addressing the audience on the importance of listening to local perspectives on political violence to combat political violence. 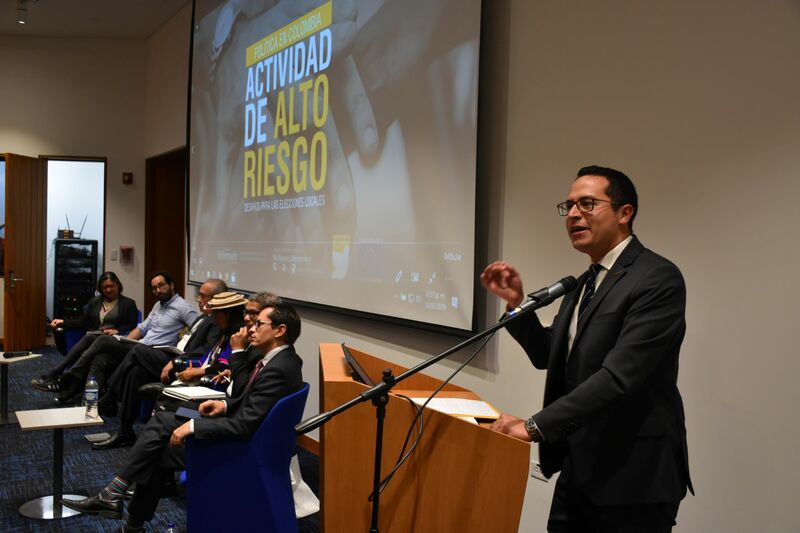 It was this which inspired NIMD Colombia to assemble two panels from across Colombia’s political spectrum to discuss the issue of political violence. 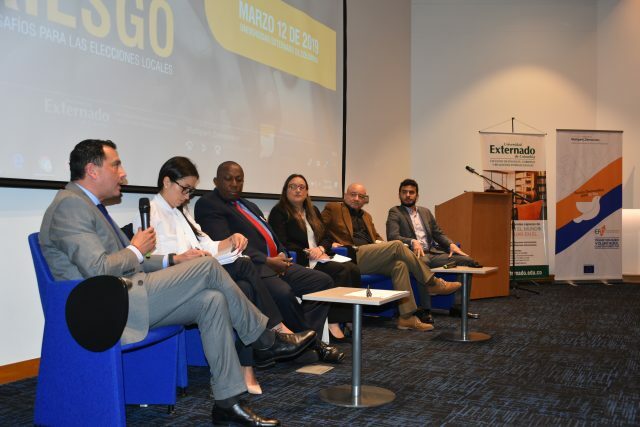 On March 12, representatives of international organizations, academia, civil organizations, and congresspeople met at the Externado de Colombia University for a public forum entitled “Politics In Colombia: High Risk Activity”. The March 12 forum hosted two panels. The first, entitled “Balances and proposals for the security of the exercise of the policy to 7 months of local elections”, featured Camilo Vargas of the Electoral Observation Mission, Senator Julián Gallo, spokesman for the bench of the Alternative Revolutionary Common Force, who argued for preventative government policies and a national political pact respectively. Alongside them in the first panel was Lorena Zabala, coordinator of the Prevention and Protection Group of the Attorney General’s Office, Ceferino Mosquera, president of the National Confederation of Community Action, and Paola Montilla, professor at the Externado University. The first panel, which discussed how to provide security to political leaders ahead of local elections later in the year. The second panel of the event tackled the regional perspectives of security challenges in politics. 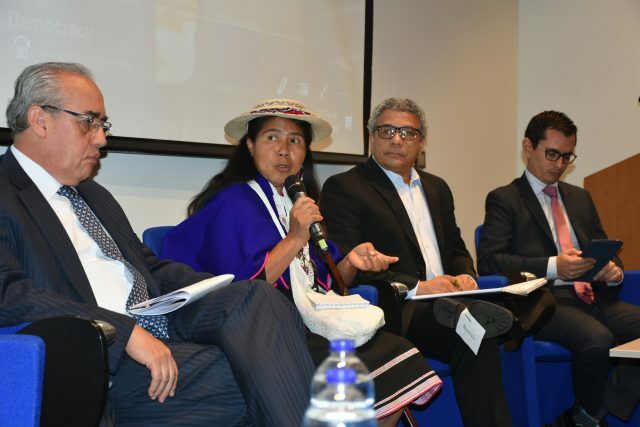 Featuring representatives from indigenous communities, security experts, and academics, the panel put the spotlight on how local actors defend themselves and how parties can make a difference to the security of politicians and activists in their constituencies.